Side A : 1. Bo Diddley / 2. Heroin / 3. Slippin' And Slidin' / 4. I'll Be You Baby Tonight. Side B : 5. Louie Louie / 6. Slippin' And Slidin' / 7. Concerto In D Major / 8. Around And Around / 9. Ellas. 1 : Ellas McDaniels / 2 : Lou Reed / 3, 6 : R. Penniman, E. Bogage, A. Collins, J. Smith / 4 : Bob Dylan / 5 : Richard Berry / 7 : Antonio Vivaldi / 8 : Chuck Berry / 9 : Maureen Tucker. 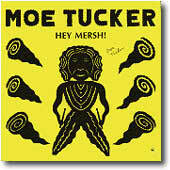 Notes : recorded in Moe's living room (aka 'Trash Records', Phoenix, AZ), manufactured and distributed by Rough Trade. Maureen Tucker played all the instruments. There is an October 1992 German reissue in a white jacket (M.T.-1441) - those LPs were pressed by Moe Tucker and the band to sell on the road. CD, 50 Skidillion Watts-Boudisque MOE 7-2, Germany, 199? 1. Hey Mersh! (3:16) / 2. Spam Again (5:25) / 3. Goodnight Irene (2:29) / 4. Chase (8:07) / 5. Andy (5:08) / 6. Work (3:38) / 7. Pale Blue Eyes (6:44) / 8. Bo Diddley (5:07) / 9. Talk So Mean (4:59) / 10. Do It Right (3:10) / 11. Guess I'm Falling In Love / 12. Baby What You Want Me To Do / 13. Why Don't You Smile Now / 14. Hey, Mr. Rain. (tracks 11-14 only on Rev-Ola reissue). 1, 2, 5, 6, 9 : M. Tucker / 3 : Huddie Ledbetter & John A. Lomax / 4 : all players & M. Tucker / 7 : Lou Reed / 8 : E. McDaniel / 10 : Jad Fair & Daniel Johnston / 11, 14 : The Velvet Underground / 12 : Jimmy Reed / 13 : Reed, Cale, Vance & Phillips. Notes : recorded March 1988 at Noise New York and June-October 1988 at Mirror Image, Gainsville (Florida). With the help of members of Sonic Youth, Jad Fair, Daniel Johnston. Lou Reed plays guitar on Hey Mersh ! and Pale Blue Eyes. 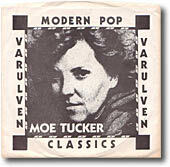 The LP came with an insert and promo copies with inserts and a photograph of Moe. Also exists as test pressing on Rainbow records. First CD pressing with brown label, second pressing with white label. The Rev-Ola CD reissue has a different cover, includes four bonus tracks taken from the MoeJadKateBarry EP and exclusive liner notes by Jonathan Richman. 1. Fired Up / 2. That's B.A.D. / 3. Lazy / 4. S.O.S. / 5. Blue, All The Way To Canada / 6. (And) Then He Kissed Me / 7. Too Shy / 8. Stayin' Put / 9. Baby, Honey, Sweetie / 10. I'm Not / 11. I'm Waiting For The Man. Notes: some LP copies came in green vinyl. The CD version (rose 273 cd) has I'm Waiting For The Man as extra track. Japanese issue includes lyrics. 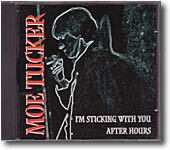 Moe says : 'I Spent A Week...' was recorded in New York. I was lucky enough to have lots of volunteers playing on this, and I think the result is pretty interesting. I love Brian's bass on 'B.A.D. '; Cale's viola on 'Kissed Me'; Lou's making noise on 'Fired Up'; Victor's drumming; Sterling's wife, her sister, and my cousin making their vocal debut as backup singers; and I'm proud of my saxophone arrangements! I think this is a fun little album and think it sounds pretty damn good, considering the small amount of time we had, and the quality of the studio. 1. Spam Again / 2. Hey, Mersh / 3. Stayin' Put / 4. That's B.A.D.S. / 5. Goodnight Irene / 6. Too Shy / 7. Talk So Mean / 8. Lazy / 9. Baby, Honey, Sweetie / 10. S.O.S. / 11. Fired Up / 12. Too Shy / 13. Bo Diddley. Notes: CD only. Recorded live at l'Ubu, Rennes, France, on February 23, 1992. The Japanese issue includes lyrics, extra photo of marquee, Sterling and Moe. 1. Crakin' Up / 2. Me, Myself And I / 3. I've Seen Into Your Soul / 4. I Don't Understand / 5. Crazy Hannah's Ridin' The Train / 6. Danny Boy / 7. Little Girl / 8. Saturday Night / 9. Train / 10. Poor Little Fool / 11. I Wanna. Notes: CD only. Sterling Morrison plays on five tracks. The New Rose edition has a booklet with lyrics. Original title was Inexplicably Spankled While Leading A Conga Line. Japanese issue also includes lyrics of all tracks including the 3 cover-songs. Moe says: I'm very happy with 'Dogs Under Stress'. Phil, the engineer and owner of the studio, did a faboulous job, and the overall sound is so much better than anything I've done before. And for the first time I had the luxury of not having to worry too much about the clock (thanks to Phil) and was also able to mix in a proper studio! I'm also very pleased with how each song "came out". I particulary like 'Crackin' Up' and 'I've Seen Into Your Soul', both of which are just whet I had envisioned. 1. Fired Up (3:57) / 2. I'm Waiting For The Man (5:24) / 3. Blue All The Way To Canada (3:48) / 4. Too Shy (3:19) / 5. And Then He Kissed Me (2:40) / 6. I'm Not (6:38) / 7. Me, Myself And I (2:41) / 8. I Don't Understand (2:40) / 9. Danny Boy (5:20) / 10. Little Girl (2:55) / 11. I Wanna (2:53) / 12. Crackin' Up (4:59) / 13. I've Seen Into Your Soul (5:42) / 14. Saturday Night (3:51) / 15. Train (6:20). 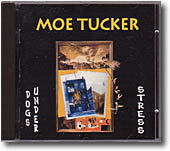 Notes: CD compiled from I Spent A Week There The Other Night (tracks 1-6) and Dogs Under Stress (tracks 7-15). 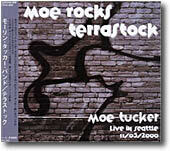 Notes: recorded live Terrastock Festival at The Showbox, in Seattle, November 5, 2000. Features: Moe Tucker - guitar, lead vocals, John Slugget - drums, Greg Beschers - lead guitar, vocals, John Abbay - bass, vocals, Doug Yule - vocals & piano (3), guitar (4). Produced by John Craig. Notes: side 1 offers the legendary duet by Moe and Jonathan Richman. 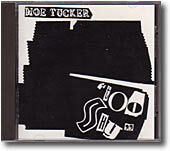 Personnel: Moe Tucker/Jonathan Richman (vocals), Willie Alexander (keyboards, backing vocals), George Nardo (guitar), Walter Powers (bass), Jim Wilkin (drums). This song was recorded February 24, 1974 in Boston at Music Designers studios. Came with liner notes insert backed with a poster of a gig Jon Richman played the night before this historic recording session in 1974. Around And Around / Will You Love Me Tomorrow? 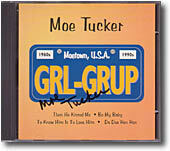 Notes: Moe's solo debut with covers of Chuck Berry and Shirelles standards. 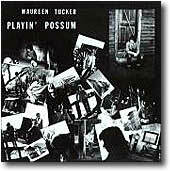 Around And Around is also included on Playin' Possum LP but B-side Will You appears only on this rare single. Side 1: 1. I'm Sticking With You / 2. Will You Love Me Tomorrow. Side 2: 3. Foggy Notion / 4. Foggy Notion / 5. Foggy Notion. 1: same as Modern Pop 7 inch / 2 : same as Around And Around 7 inch B-side but without tambourine / 3: Count Joe Viglione, mix 2, new vocal; originally released on Flamingo/Carrere in Paris, 1978; the first contract issued by Patrick Mathe, founder of New Rose Records; remixed on March 1, 1985, recorded in 1977 in Arlington (basic tracks), in 1978 re-mixed in Newton... features Willie Alexander on backing vocals , John JHovorka of The Turbines on bass, Paul Robinson on drums (brother of Cars drummer David Robinson) / 4: Count Joe Viglione, live 12/27/78 at The Club in Cambridge, Mass (11 piece band) / 5: live 11/25/79 at Paradise in Boston. Notes: mastered by Trutone, in New Jersey, USA, April 4, 1985 and again on April 23, 1985. Pressed in May. Originally, catalog # was VAR 9D, but was later changed on the pressing to VAR 11D. Side 1: 1. Guess I'm Falling In Love / 2. Baby What You Want Me To Do / 3. Jad Is A Fink. Side2 : 4. Why Don't You Smile Now? / 5. Hey Mr. Rain. 1, 5: The Velvet Underground / 2: Jimmy Reed / 3: Messer/Stock/Tucker / 4: Reed/Cale/Vance/Phillips. Moe Tucker (drums, vocals on 4), Jad Fair (vocals, guitar on 5), Kate Messer (guitar), Barry Stock (bass, lead guitar on 1, 4, 5) + Mark Jickling (guitar on 5), David Fair (harmonica on 2), John Dreyfuss (saxophone on 3). Produced by Jad Fair, recorded at Flipside Studio, Longwood, Florida. 1. Hey Mersh ! / 2. Talk So Mean / 3. Talk So Mean (alternate non-LP mix). 1. Too Shy (3:28) / 2. Fired Up (3:49). 1. The He Kissed Me / 2. Be My Baby / 3. To Know Him Is To Love Him / 4. Da Doo Ron Ron. Notes: recorded and mixed at Casino Studio, Atlanta GA.
1. I'm Sticking With You / 2. After Hours. Notes: the band is Allan Bishop (bass, vocals), Bennie Baresi (guitar), Jesse Akkari (guitar), David Oliphant (guitar) and Moe Tucker (drums). 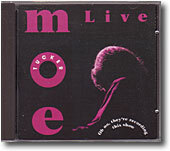 Moe Tucker: Too Shy, Live, March 1990, Germany. Notes: AIDS fund-raiser various artists compilation. Notes: Moe plays the drums and is producer. 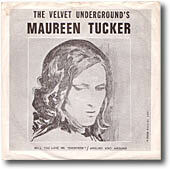 The track also appears on Fifteen Minutes - A Tribute To The Velvet Underground sampler (Imaginary ILLCD 047, UK, 1994). Notes: compilation of love songs. Kate is Moe's daughter and plays violin and saxophone. 2-LP set includes insert and postcard. Notes: free with Winter 1994 issue (no. 47) of The Bob magazine. Also with Unrest and Red Kross tracks. Notes: Moe played with Sterling Morrison and John Cale on People Who Died, a Jim Carroll song. 1. Pop conversation #1 - Various Artists / 2. At the airport #A - Instant Cafe Records / 3. Her words hang in the air - Ladybug Transistor / 4. 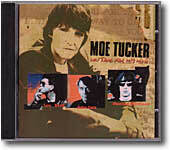 Will you still love me tomorrow - Moe Tucker / 5. The Girl from UNCLE - The Four Corners / 6. Loud and laughing - Shermans / 7. Comme d'habitude - Souvenir / 8. Star watcher's songs - Instant Cafe Records / 9. Flashin' light (some girls like to disco) (Cocosume remix) - Valvola / 10. London - Noonday Underground / 11. Liebe auf dem land - Die Moulinettes / 12. White drops - Plus Tech Squeezebox / 13. Mon ange gardien - April March / 14. 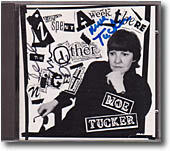 To know him is to love him - Moe Tucker / 15. Fine day - Three Berry Ice Cream / 16. Sun keeps shining on me - Fonda / 17. Free - The Mondo Crescendo / 18. Hey lover - Aislers Set / 19. Don't - Mirah / 20. Let drive at him - Instant Cafe Records / 21. Summertime - Faraway Places / 22. 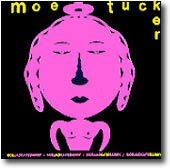 I wanna (live) - Moe Tucker / 23. 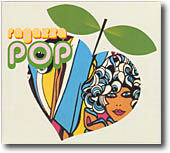 Pop conversation #2 - Various Artists. 4: B-side of 1981 Around And Around 45 (first appearance on CD) / 14: from 1997 GRL-GRP CDEP / 22: live at Realtime, Savannah GA (previously unreleased). Notes: Moe Tucker (drums), Chuck Bell, Jad fair, David Greenberger, Erik Lindgren, Philip Milstein, and Andy Paley. Notes: Moe plays percussions on two songs: Last Great American Whale and Dime Store Mystery. Notes: Moe changes TV channels for track 10. Workdogs are a rythm section of two people Rob Kennedy and Scott Jarvis, who play with various guests. 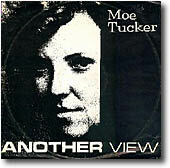 Both were in Moe Tucker's road band and Scott play drums on several songs of Moe's Life In Exile album. See Workdogs page for more information. Notes: Shotgun Rationale is Sonny Vincent's band. Moe sings backup vocals on Fun In The Sun. Sterling plays guitar on another song. Notes: Moe is producer. Line-up is Jad, Don Fleming, Hank Beckmeyer and John Slugget. CD includes Always as bonus track. Notes: Moe produces and plays drums on It's No Wonder and Fire In The Sky and guitar on Gates Of Glory. Safe House's issue includes bonus tracks with cover of I Heard Her Call My Name. More infos on The Half Japanese Page. Notes: Maureen plays kit for Dancing Undercover and Set Me Free. Notes: Moe is producer. The band is Paul K on guitar & vocals, Steve Poulton on bass, and Glenn Kotche on drums. See Paul K & The Weathermen web page for more information. 1. Julie (3'13) / 2. Banger (2'57) / 3. Summer & Winter (2'28) / 4. Everyone (3'50) / 5. One Day (2'37) / 6. Even If... (3'07) / 7. Better Way (3'17) / 8. Don't Be A Penguin (5'22) / 9. On We Go (3'20) / 10. Not My World (4'24) / 11. Smiles (3'10) / 12. Let's Order Some Thai Food (3'31) / 13. Down Down (3'14) / 14. Blame (6'06). Notes: Magnet is Mark Goodman, Mike Rivard, Dan Brenner and Moe who plays drums and sing on Summer & Winter and Don't Be A Penguin. Recorded at Excello Recording between March and June 1996. Notes: Moe plays drums. "Eat/Kiss reunites John Cale with The Velvet Underground original mentor Andy Warhol in Cal's score for these two early Warhol films. Recorded live at a 1995 performance in Lille, France". With Sterling Morrison (155 min). 1. Blue, All The Way To Canada / 2. Fired Up / 3. Too Shy / 4. Train. Notes: 4 tracks recorded during March 1992 at BBC Studios in London, UK with Sterling Morrison, Daniel Hutchens, Sonny Vincent and John Slugett.